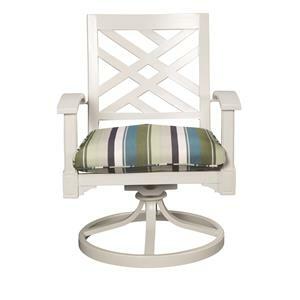 Simple, easy to move or stack, this dining chair can provide you with additional seating while enjoying a meal or drinks outside. Add these chairs around an outdoor table to create a fun entertaining space while also enjoying sunshine and fresh air. 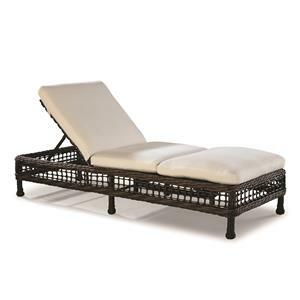 Catch some rays from the comfort of this outdoor chaise. Create a fun poolside lounging area with the addition of this long chaise lounge where you can stretch out and be comfortable from head to toe. Prop your feet and add additional comfort to a chair with this glider ottoman. This ottoman has a woven frame and cushioned top and the ability to glide back and forth with you as you sit in a glider chair. 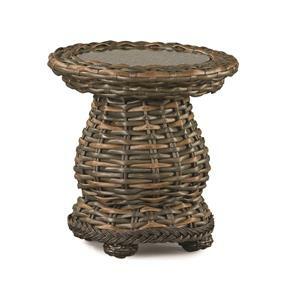 Round with a glass top, this end table can put the finishing touch on your outdoor lounge space. This end table can be the perfect place to set a drink or snack as you kick back and enjoy time outside. 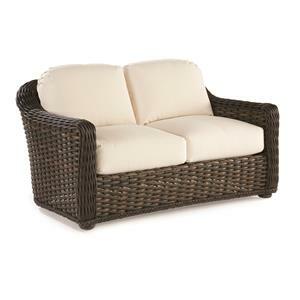 Create an outdoor living room with this loveseat. A woven frame and comfy cushions come together to create a space for you to enjoy time spent outdoors. Whether it's poolside or on a patio this love seat can accent other seating and create an entertaining space that you love. 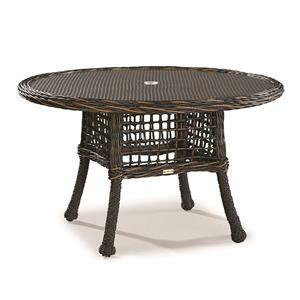 Create a fun outdoor dining room with this round table. This table has a woven top and base and an umbrella hole so you can add in some shade on a sunny day. Pair this table with coordinating chairs for a fun outdoor space where you can kick back and enjoy food or drink while getting fresh air. 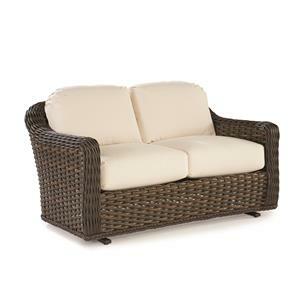 Create an outdoor living room with this gliding loveseat. Whether it's poolside or on a patio this love seat can accent other seating and create an entertaining space that you love. With a glider base you can gently move back and forth for a relaxing movement. With room to seat six, this double pedestal dining table allows you to create a fun place to enjoy a meal while also spending time outside. This table sits on two large pedestals and has a rectangle top with an umbrella hole so you can create shade on a sunny day. 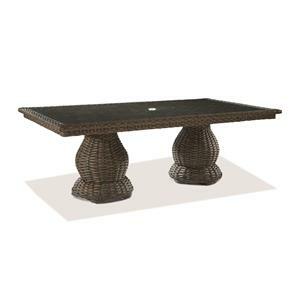 Use this table to create an outdoor dining room where you can host friends or family and relax. 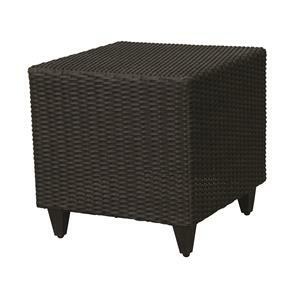 Simply designed with a clean look, this square end table provides with an added detail for your outdoor living room. 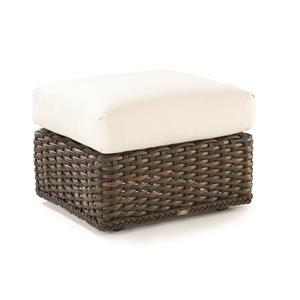 Use this end table to set your drink down as you relax in the sunshine and fresh air. This end table has a square shape for a contemporary look. Since our inception in 1972, Laneventure has offered casual home furnishings that are fun, fashionable and functional. The addition of the WeatherMaster line brought these same attributes to outdoor furnishings and established the company as a leader in the outdoor furniture market. Our parent company, Furniture Brands International (FBN: NYSE), one of America ’s largest furniture marketers, provides the resources to maintain our commitment to excellence. Laneventure is built upon a reputation of innovation, quality and character, and we stand behind every single product that we make. You can be sure each item will remain beautiful through the rigors of everyday living. Laneventure products are not simply well-designed, they are well-built. Our frames are built with great attention to enduring construction and fine detail in facilities around the globe, with key resources in Central America and Asia . Hand-tailored upholstering and finishing are accomplished in our 600,000 sq ft complex in Conover, NC , where we warehouse our products for timely service to fine stores nationwide. Laneventure is distinct in offering imaginative designs for indoors and outdoors – all built of the finest materials. 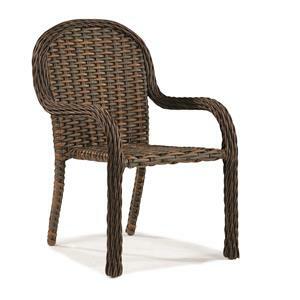 WeatherMaster includes heirloom quality natural wicker, modern synthetic weaves, exotic finished metals, cast aluminum, teak and painted cypress furniture – all built to the highest standards using the most advanced technologies alongside fine, old world handcrafting. Excursions offers you a worldly retreat within daily reach, right at home. Excursions furniture designs by Laneventure offer unique styling that is suited for use in a variety of settings. Used as accents to your already eclectic surroundings, Excursions products can easily become the focal point of any room, possibly a conversation item. “Where in the world did you find this?...” a guest may ask. Your reply is as colorful as your imagination.